THE STATION WILL BE LIVE DURING DAYLIGHT HOURS ALL WEEKEND!! The reason I opened this station was mainly to broadcast the LIVE TRAVEL BEAD SHOW from, but it is proving to be invaluable to showcase all sorts of projects I’m working on. I hope to do live streaming video from the Iphone when in Chengdu and Thailand as well!! The possibilites are endless. THE STREAMING VIDEO BUTTON WILL BE VISIBLE ON ALL MY WEBSITES BY THE END OF THE WEEKEND!!! HAVE AN INCREDIBLE WEEKEND MY FRIENDS!! I WILL DO SOME DRAWING WINNERS THIS WEEKEND. I APOLOGIZE FOR GETTNG BEHIND. THE BEAD SHOW HAD BEEN TAKING ALL MY TIME AS I WANT TO GET THE SHOW UP AND RUNNING IN TIME FOR YOU ALL TO BE ABLE TO CREATED YOUR JEWELRY FOR GIFTS AND SALES. 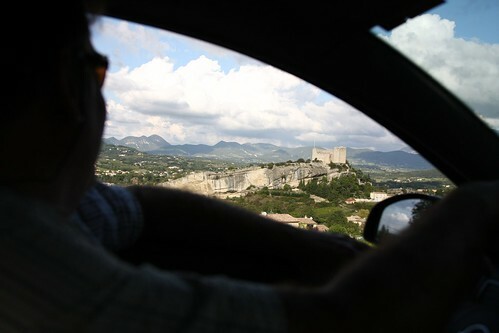 A gaze onto a hilltown in Provence from the passenger seat……SIGH!!!!!!!! checked it out…..it looks like it will be so fun. the chat room is not working right now is it? its 12:17 central dstime and i didnt see anything. i want to be sure my computer is capturing everything you have done so far so i dont miss out on the bead stuff. you know how nuts i am about the beads you put together! hahahah. your own TV station…….next step………an EMMY AWARD !!!!!!! Way to go girl!!! !